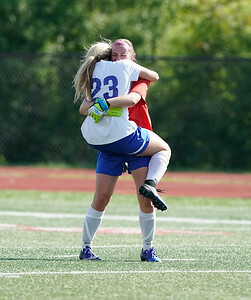 Johnsburg's Taylor Piggott (23) hugs Johnsburg's Shae Giovanni after they defeat IC Catholic during the 1A third place state final game at North Central College in Naperville May 27. 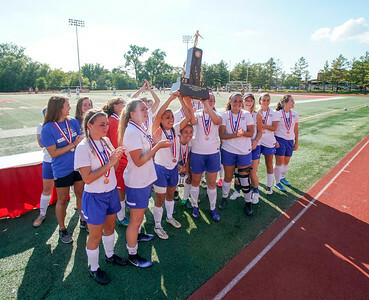 Johnsburg's raises their third place trophy in celebration during the awards ceremony for the 1A third place state final at North Central College in Naperville May 27. 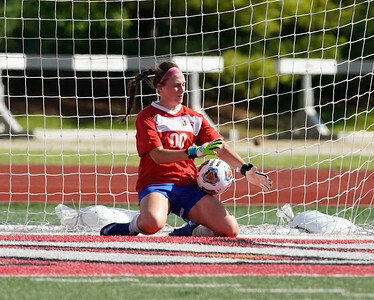 Johnsburg's Shae Giovanni successfully defends the net during an against the IC Catholic penalty kick in overtime during the 1A third place state final game at North Central College in Naperville May 27. 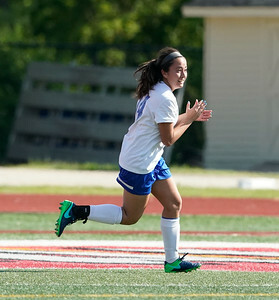 Johnsburg's Amber Humphres (14) reacts after scoring a goal on a penalty kick in overtime against IC Catholic during the 1A third place state final game at North Central College in Naperville May 27. 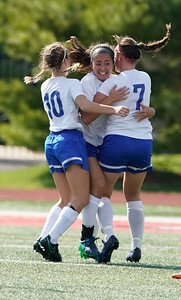 Johnsburg's Amber Humphres (14) is hugged by Kasidee Hass (10) and Shae Giovanni (7) after scoring a goal against IC Catholic during the 1A third place state final game at North Central College in Naperville May 27. 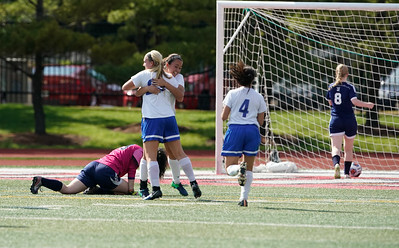 Johnsburg's Amber Humphres (14) and Taylor Piggott (23) celebrate after scoring a goal against IC Catholic during the 1A third place state final game at North Central College in Naperville May 27. 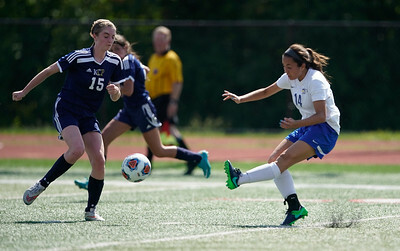 Johnsburg's Amber Humphres (14) plays the ball against IC Catholic during the 1A third place state final game at North Central College in Naperville May 27. Johnsburg's Madeline Hauck (5) moves the ball up the pitch against IC Catholic's Kaitlyn Grady (15) during the 1A third place state final game at North Central College in Naperville May 27. 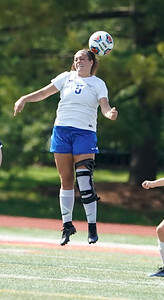 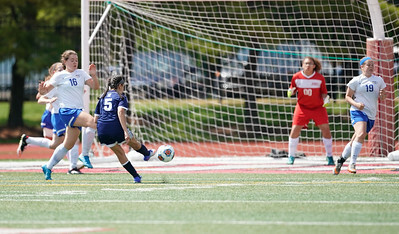 IC Catholic's Olivia Hurt (5) shoots the ball for a goal against Johnsburg during the 1A third place state final game at North Central College in Naperville May 27. 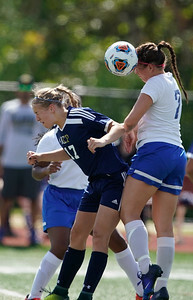 Johnsburg's Shae Giovanni (7) goes up for a header over IC Catholic's Abi Wagner (17) during the 1A third place state final game at North Central College in Naperville May 27. 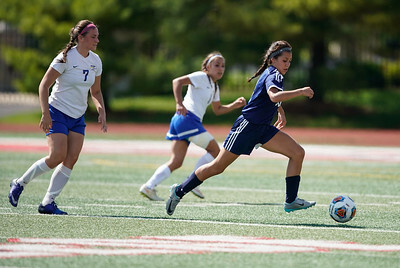 IC Catholic's Bella Leslie (19) moves the ball up the pitch against Johnsburg's Shae Giovanni (7) during the 1A third place state final game at North Central College in Naperville May 27. 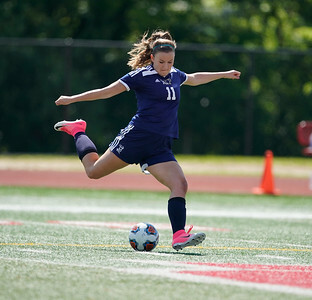 IC Catholic's Grace Fuller (11) shoots the ball against Johnsburg's during the 1A third place state final game at North Central College in Naperville May 27. 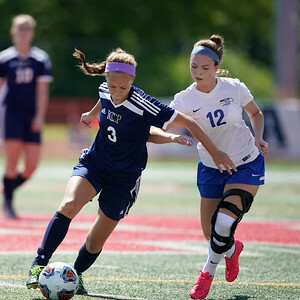 IC Catholic's Sophie Zanoni (3) plays the ball against Johnsburg's Corin Cameron (12) during the 1A third place state final game at North Central College in Naperville May 27. 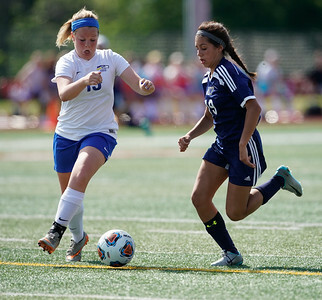 Johnsburg's Madeline Hauck (5) moves the ball up the pitch against IC Catholic's Grace Fuller (11) during the 1A third place state final game at North Central College in Naperville May 27. 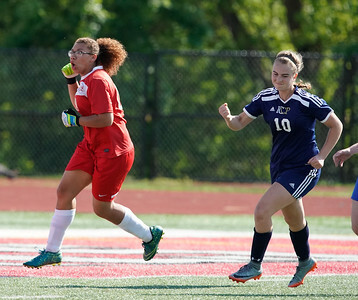 Johnsburg's Amber Humphres (14) shoots the ball past IC Catholic's Kaitlyn Grady (15) during the 1A third place state final game at North Central College in Naperville May 27. 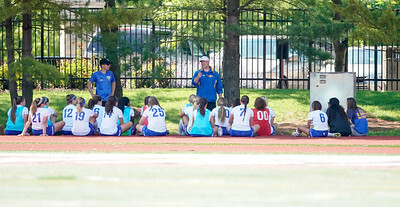 Johnsburg's head coach Rob Eastland talks to his team during the 1A third place state final game against IC Catholic at North Central College in Naperville May 27. 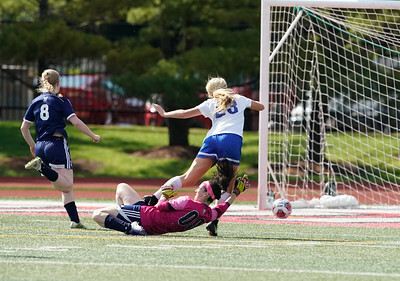 Johnsburg's Madeline Hauck (5) goes up for a header against IC Catholic during the 1A third place state final game at North Central College in Naperville May 27. 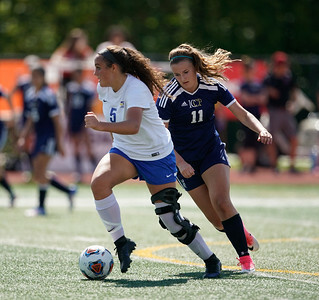 Johnsburg's Lauren Winter (left) plays the ball against IC Catholic's Bella Leslie during the 1A third place state final game at North Central College in Naperville May 27. 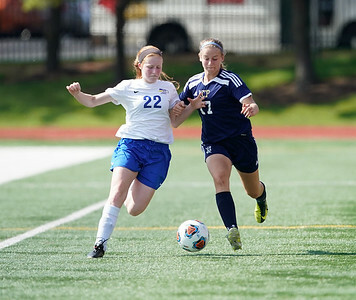 Johnsburg's Kaitlyn Owen (22) plays the ball against IC Catholic's Abi Wagner (17) during the 1A third place state final game at North Central College in Naperville May 27. 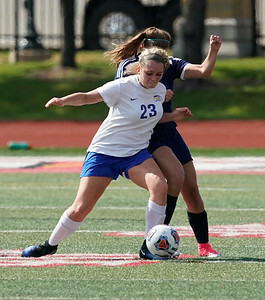 Johnsburg's Taylor Piggott (23) plays the ball against IC Catholic's Grace Fuller (11) during the 1A third place state final game at North Central College in Naperville May 27. 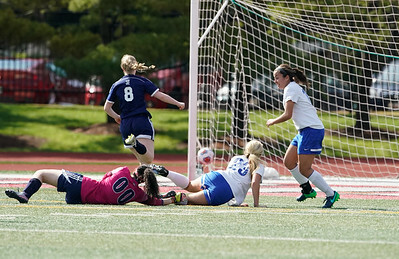 Johnsburg's Taylor Piggott (23) watches her shot sail towards the open net as she crashes into IC Catholic keeper Rochelle Spizzirri (00) during the 1A third place state final game at North Central College in Naperville May 27. 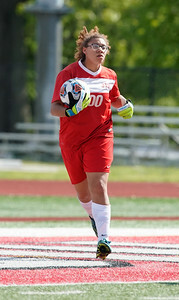 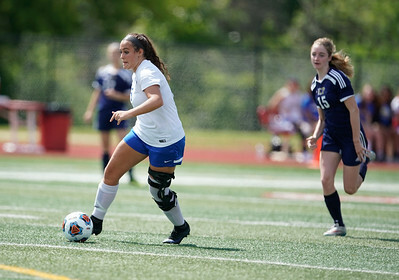 Johnsburg's Jessica Strzelczyk (0) looks down field against IC Catholic during the 1A third place state final game at North Central College in Naperville May 27. 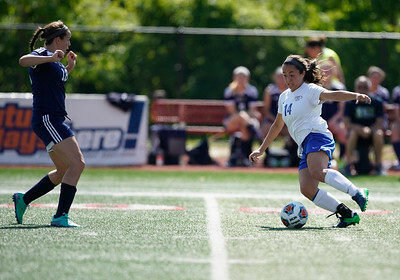 Johnsburg's Hannah Anderson (16) heads the ball against IC Catholic's Olivia Hurt (5) during the 1A third place state final game at North Central College in Naperville May 27. 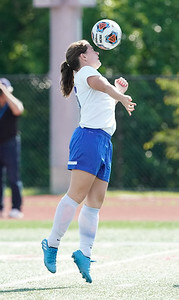 IC Catholic's Tessa Langan (10) reacts after scoring a last second goal against Johnsburg's during the 1A third place state final game at North Central College in Naperville May 27. 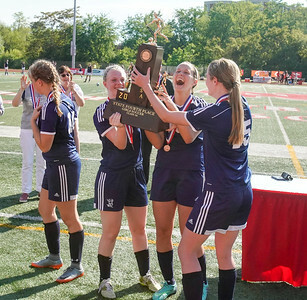 IC Catholic raise their 1A forth place trophy in celebration during the awards ceremony for the 1A third place state final at North Central College in Naperville May 27.